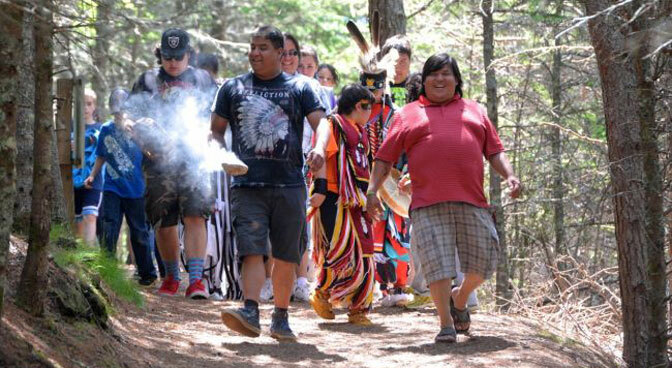 As well, a major component of the trail revitalization has been to introduce the historical and cultural aspect of the Mi’Kmaq people. The Tkipok Trail was formerly known as the Utkubok Trail to the Tkipok Trail – to reflect changes in the Mi’Kmaq language the name was changed. There are interpretative signs placed along the trail. These signs include science, wilderness, cultural and historical information that will also include translations into the Mi’Kmaq language. In addition to the fitness aspect of the trail, it serves as a large educational resource as well. It is hoped that other schools will also take advantage of the trail for their studies of the outdoors and of Mi’kmaq culture.